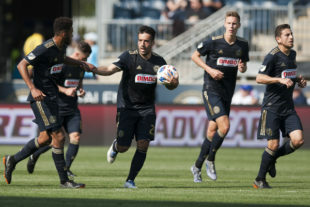 With D.C. United sitting back, content to defend and counter all day Saturday, Philadelphia Union needed a bunker buster. Enter Ilsinho, who pried D.C. United open with some help from his friends. No player on the field touched the ball so frequently, with Ilsinho averaging 1.19 touches per minute. The Union offense flowed mostly down the right side, with right back Keegan Rosenberry much like a holding midfielder in possession and Borek Dockal often floating to the right. But it was Ilsinho who broke open the bunker with his trademark tricky dribbling . No matter how many defenders United dropped, the Brazilian still found a way to dribble through them. By creating space where there was none, he opened up himself to create three passes and his teammates to make a few more. It was his goal in the 37th minute that evened the match. Put aside whether he should have been statistically credited with the goal. (It looked like an own goal. The ball clearly deflected off a defender and changed directions.) Whatever the stats say, Ilsinho most certainly created it and forced the defensive action that resulted in the deflection into net. When Ilsinho came off in the 68th minute, it didn’t seem like he had been quiet for that long. The substitution made sense nonetheless, as Ilsinho’s contribution was clear and it was not worth risking an injury to a player making his first start of the year. Fafa Picault brought on fresh, speedy legs. Credit to Union head coach Jim Curtin for getting things right not merely on starting Ilsinho but on making the right substitution. Credit Ilsinho for his play. We do. He’s PSP’s Player of the Week. Borek Dockal. One memorable goal, seven key passes, three shots on target, a nice touch on long balls (5 for 5 on the day), and a win. That’s the player Union fans have been waiting to see. When we first saw him step on the pitch a few years back,chubby and sluggis looking,his first drives at the defence were mind blowing. He appeared to have Velcro on his feet to keep the ball exactly where he wanted. Now he is one of the most fun dribblers to watch. Well deserved for this week. Also ,on this fine day, thanks to you Mr. Walsh! A fine job you and the PSP staff do every week! 9 years reading and enjoying! Agreed. While he can be inconsistent and is far from the fastest player in a footrace, when he’s on his game Ilsinho has been the Union player that’s been the most fun to watch over the years.